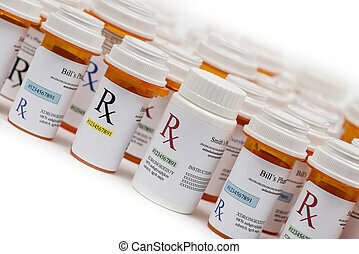 Looking down on a large group of prescription medicine bottles. 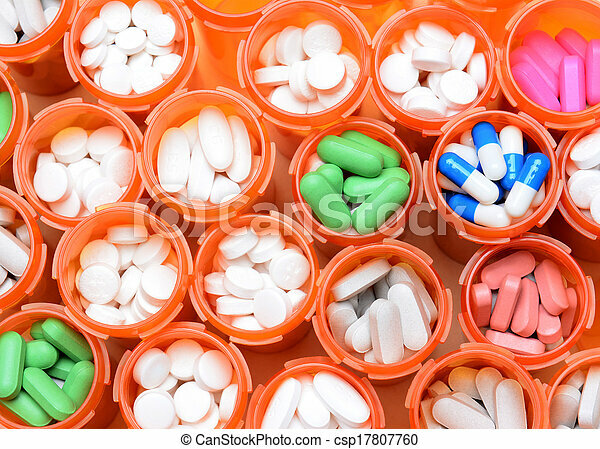 The bottles all have their caps off and have a variety of drugs, tablets and capsules. 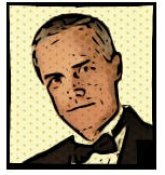 Horizontal format filling the frame. 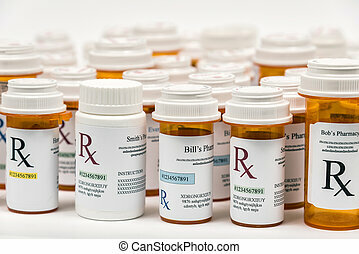 Close-up Horizontal shot of a large group of prescription medicine bottles. 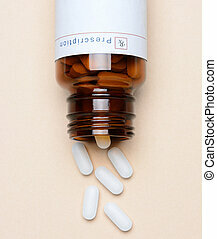 Horizontal shot of Rx Prescription Medicine Bottles on the diagonal on a white background. 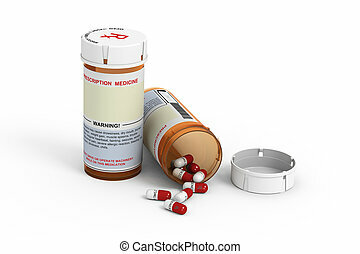 PLEASE NOTE: ALL INFORMATION ON PRESCRIPTION LABELS IS MADE UP. 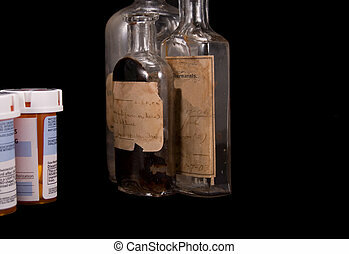 Collection of one hundred plus year old medicine bottles, black iso. 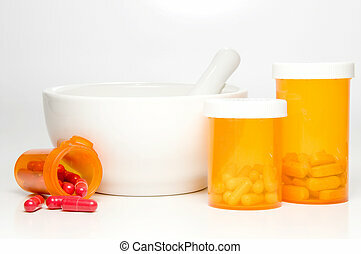 Prescription medicine bottles and a mortar and pestle. 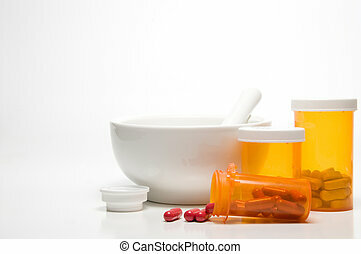 Rendered prescription medicine bottles. 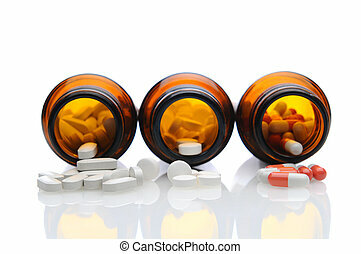 One closed and one open with pills spilling out on white background. 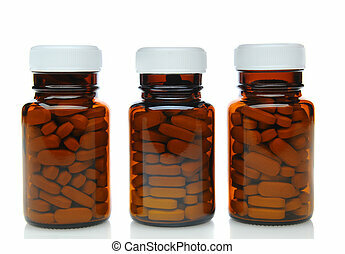 Three medicine bottles spilling pills. 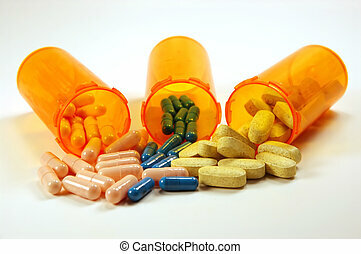 A closeup of three prescription medicine bottles laying on their sides with pills spilling onto a blue surface. 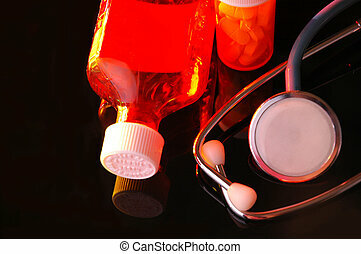 Overhead shot with the bottles as the main focus. 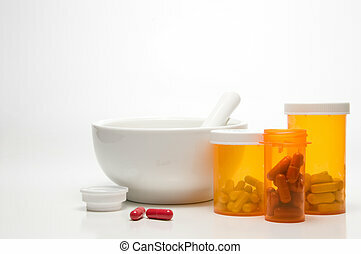 Three brown prescription medicine bottles on a white surface with reflection. 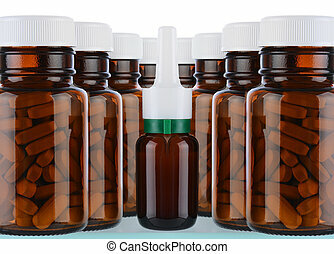 One bottles is tilted and resting on another bottle. Horizontal format. 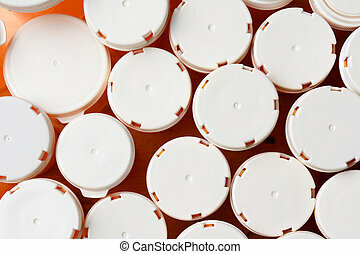 High angle shot of a group of prescription medicine bottles. 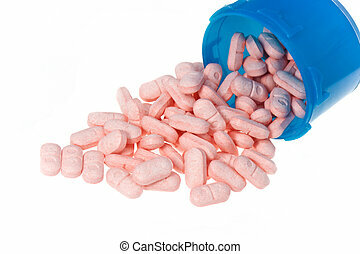 The tops are blank and are various sizes. Horizontal format filling the frame. 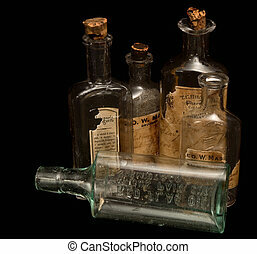 A variety of glass medicine bottles on glass shelves. 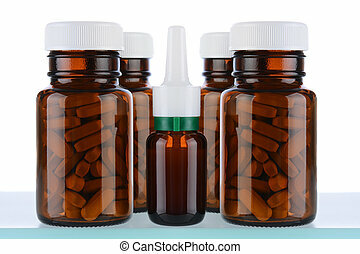 Bottles have no labels, over a white background. 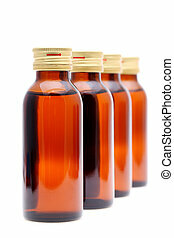 A variety of brown glass medicine bottles on a shelf. 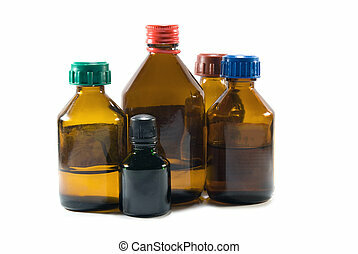 Bottles have no labels, over a white background. 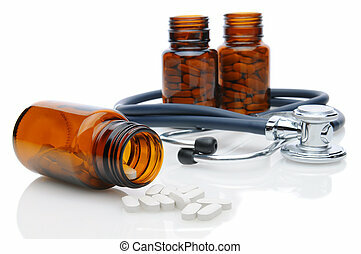 Medicine bottles and a stethoscope on white with reflections. 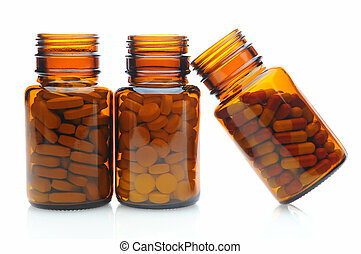 Closeup of three brown medicine bottles filled with pills on a white background with reflection. Horizontal format. 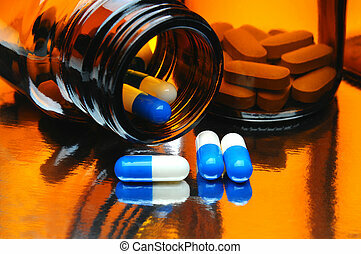 Closeup of Brown Medicine bottles with blue and white capsules and pills on a reflective surface. Horizontal format fills the frame. 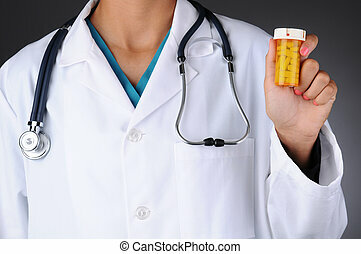 Closeup of a nurse holding a bottle of prescription medicine. 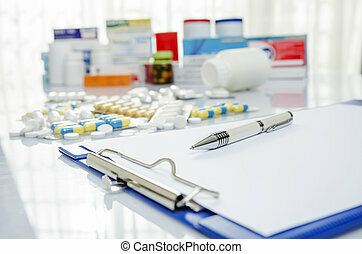 Horizontal format over a light to dark gray background. Woman is unrecognizable. 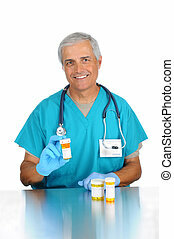 Smiling middle aged doctor holding up a prescription bottle filled with medication with two additional bottles on the table in front of him. Vertical format isolated on white. 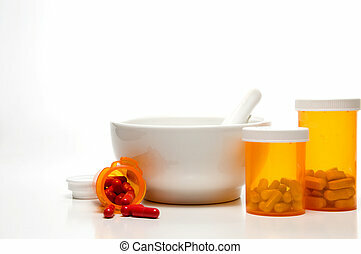 Overhead view of a glass prescription medicine bottle laying on its side with pills spilling onto the surface. 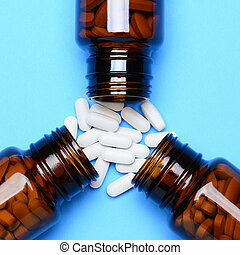 Closeup of three brown prescription bottles on their sides with pills spilling onto white reflective surface. 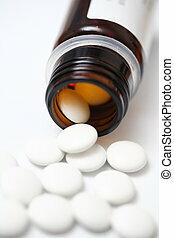 Shallow depth of field with focus on foreground medicine. 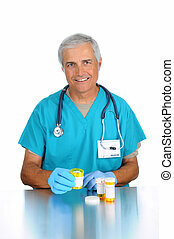 Middle aged doctor wearing scrubs and a stethoscope seated at a counter holding a prescription bottle full of pills. Vertical format isolated on white.